Shrila Bhativedanta Narayana Gosvami Maharaja: Dipavali means a time of happiness. When Lord Rama defeated Ravana and reached Ayodhya, a big Dipavali festival was performed there. Shri Vamanadeva wanted to cheat Bali Maharaja. He did not cheat him; rather he gave his mercy, although it seemed that he was cheating. When Bali Maharaja was offered a benediction from the Lord, he requested, "Always remain in my home." In this way the Lord Himself was cheated. Lord Vamana was very glad, and he agreed to stay there forever. Due to great happiness, Bali Maharaja then asked all his associates to hold a Dipavali festival, and that was the first Dipavali. When Krishna defeated Duryodhana and returned to Dvaraka, a Dipavali was also celebrated there. Lord Krishna Himself, along with Mother Yasoda, Nanda Baba and all other Vrajavasis, came here and celebrated this festival with their own hands. In other words they themselves offered dipa (a lighted ghee wick) and rendered many other services. 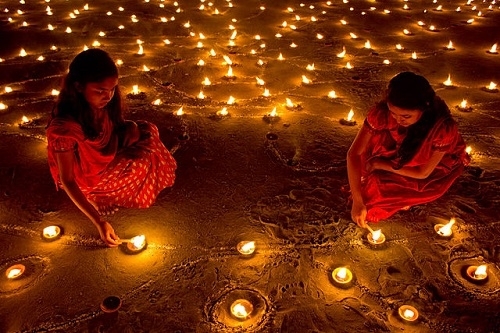 Divali also means light. 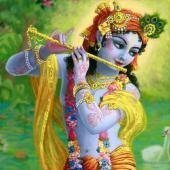 If there is no bhajana of Krishna there is darkness, and in Krishna Consciousness there is light. We celebrate this function in order to give up darkness and to bring the light of bhakti, pure devotion. This is the same celebration. Real happiness comes from playing karatalas and mrdangas. If one hears this, and if maya hears, maya will go away at once. Shri Chaitanya Mahaprabhu brought the sankirtana movement to this world to drive out maya. Shri Krishna and Shri Chaitanya Mahaprabhu do this Themselves, and we should try to follow Them.